School is out for the day! Drop off your student off at the zoo for a fun, exciting and educational day off. This informal and relaxed program will give students the day off they need, all while exploring activities about the animals here at the zoo. The programs last from 8:30 am-3:00 pm, but drop off and pick up may be at any time between 8:00 am-3:00 pm. This program is open for children in Grades K-5. Be sure to dress for the weather as we will explore the zoo grounds. An afternoon snack of popcorn and juice will be provided but children must bring their own lunch. Spend your vacation discovering a day in the life of our camels. Learn what they eat, where they sleep, and even help us with day-to-day camel activities. They might not be on TV but you will learn that this family of camels are way more entertaining. And with their winter coats returning you’ll see they even dress with the season. At this time of year, many people begin to prepare for the season of giving. 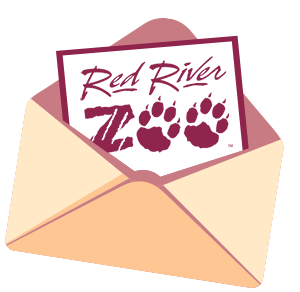 Here at the Red River Zoo we prepare as well by creating special gifts for our animals. Most of the animals enjoy gifts that they can play with, such as special puzzle toys or games they can play. While some animals might enjoy gifts they can eat or smell. Join us today to learn about our animals and help us create a special game just for them. Dive into our oceans or climb the highest mountain as we explore habitats from all around the world, these very different environments have one thing in common- many species are struggling due to pollution, habitat loss, or other challenges! Today we will dedicate our adventures to see how conservation efforts help save species around the world. We will even get up-close encounters with animals who are impacted by conservation to discover how even small actions can make a big difference. Learn to navigate through nature like an animal in this day’s experience. How do different animals survive using smell, hearing, and even movement? Find out by getting an up-close look at where an animal may live. Activities will also cover how we can navigate in nature using a compass, map, or other tools that may be needed for exploration. School’s out, but that doesn’t mean we stop learning! Join us to expand your knowledge by learning what it takes to be a zookeeper. Our goal is always to give the animals the best life we can- so we will spend time with a zoo staff member to discover activities they may participate in throughout a day. From viewing animal training to cleaning exhibits, every small action can help our animals.